Drinking water needs to be clean, accessible, and bountiful. Taking away just one of these conditions can put communities at risk. This drives the Park Foundation’s Environment Program grantmaking to ensure U.S. drinking water is safe, affordable, available, protected and managed as a public resource. So when water-intensive horizontal hydraulic fracturing (also known as “fracking”) threatened to rapidly expand in New York, Park took notice. Fracking uses millions of gallons of water mixed with sand and chemicals to access pockets of oil and gas deep underground in shale rock formations. Water and chemicals used in each fracking event must be transported, stored, treated, and disposed of, with the possibility of contamination or spills at every stage. Park awarded its first fracking-related grant in 2008 after learning about New York State’s environmental impact statement review process on horizontal fracking. As more information and concerns emerged, Park began to significantly increase its grant support for public awareness and participation. The Foundation realized that more than just environmental groups were engaging; organizations focused on public health, community impacts, local economies, corporate campaign and lobbying funding, and local control also were taking on the issue. 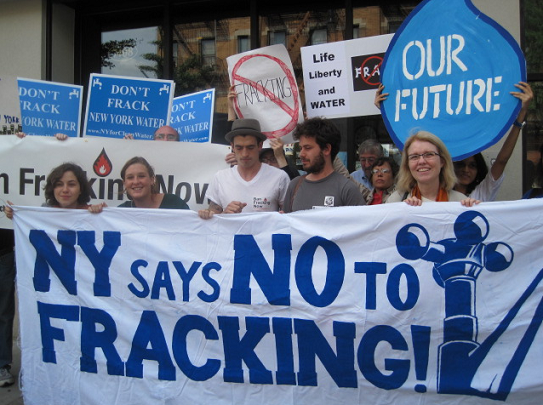 In late 2010, New York’s then-Governor Paterson signed an executive order prohibiting fracking until the state had completed its review of the impacts, effectively setting a moratorium on fracking since the review process still is not complete. As this issue rose to statewide prominence, it was clear a strong resistance to fracking was building, but divisions over strategy and goals threatened to keep concerned groups from forming a unified movement. Park hosted grantees to discuss issues, consider strategies, and encourage collaboration with the aim of helping disparate groups work together. It supported a range of activities to bolster the budding movement, including: grassroots organizing, policy and advocacy, media and communications, research, local governance tools, and legal and technical assistance. Concerns about fracking have extended beyond the Foundation’s grant-making into its investment priorities. The Park Board of Trustees has amplified the Foundation’s impact by filing shareholder resolutions on fracking with oil and gas companies, voting its stock proxies along environmental, social, and governance guidelines, and engaging with media to raise awareness. Park also helped launch and lead a new Health and Environmental Funders Network working group for funders concerned about fracking impacts on public health, the environment, and communities. The Foundation’s learning and work with other funders has paralleled the collective effort it has supported among grantees. Through almost $7 million in grants supporting field collaboration, Park and its funding partners have helped build public pressure for more time to study the issues, shielding New York’s watersheds from a drilling rush. A shareholder proposal by As You Sow, using Park shares, pressured Exxon Mobil into publicly disclosing more details of risks from its fracking activities. If New York’s moratorium stands, the contributions of many actors will have helped protect rural and urban drinking water supplies across the state.